There's no shortage of eateries and restaurants in Bahrain. If you like your burgers and fries (and are not watching your waistline) all the American chains are here including Maccas, KFC, TGI Fridays. Then there are the local equivalents too, Jasmis (Maccas style) and Shwarma express (you can guess from the name, it’s shwarma heaven). There are also a number top-end restaurants too, like the recently opened Bushido which offers Japanese fare in a rather posh and some might say pretentious setting. 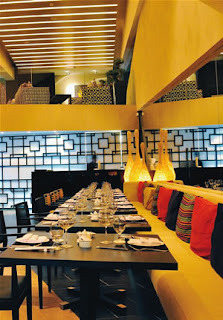 Last night we ate at Ken Lo's Memories of China in Bahrain's buzzing cafe/restaurant quarters in Adliya. After my husband had talked up the place (having eaten there without yours truly) I was looking forward to my meal and checking out the restaurant's vibrant setting that I had heard and read so much about. Memories of China in Bahrain is a franchise of a London restaurant of the same name. I haven't eaten at the London one, but I hear that it is rated by foodies as one of the best Chinese restaurants in the UK. To be honest, I'm not a huge fan of Chinese cuisine. I’ll eat it, but it’s never been on my list of favorites. I generally find Chinese food quite bland and something about it has never really appealed to my palate. Although one of Melbourne’s most highly regarded and expensive restaurants is Chinese (Flowerdrum), in Australia, cheap Chinese restaurants are as common as shwarma and grill shacks are in Bahrain. Even the smallest outback country town will be sure to have at least one Chinese restaurant down its main shopping and restaurant drag. So, although I was looking forward to the Memories of China experience, I wasn't sure that the food would really win me over. But it did. We started our meal off with steamed dumplings which were fresh and flavorsome and really hit the spot since I went on an empty stomach. We had duck pancakes for starters as well. Duck would never be my choice, but M’s a fan. The only other time I've had duck was years ago when my mum cooked a duck that dad had been given by a friend. This is not saying anything about my mum's cooking (because she truly is a great cook) but no matter how much my mum tried, she couldn't disguise the gamey smell of that duck. None of us ate that day and the house stank of duck for days. This time the duck was not stinky and combined with hoisin sauce, finely sliced spring onions and cucumber, it was quite delicious really. For our main we had fried and steamed rice with a slightly spicy Schezuan chicken and a sweet and sour prawn dish that was deliciously crispy with vegetables strewn through it. I'm not much of a dessert person, but last night I had a craving. I opted for the banana fritters with icecream. The banana fritters were not as I imagined. They were round with a crisy batter, honey sauce and sesame seeds around them. All up, it was pretty yum. (Photo at above right sourced from http://www.gulf-life.com/). By Bahrain standards, the meal was on the expensive side, but for quality Chinese food and a nice evening out, it was worth it. Apart from the food, what I like about Memories of China is the setting. With couch/cushion style seating on one side, it's cool without being too pretentious. That seems to be the balance that many restaurateurs don't seem to get right in the Middle East, sometimes there's so much concentration on grandiosity that comfort is an afterthought. Last weekend we were invited by a few friends to the Bahrain Sailing Club at Al-Jazeer beach. I've mentioned the non-existent beaches in Bahrain before, so you can understand why weren't expecting much. We were pleasantly surprised. It's certainly no five star resort, but there's a modest sandy beach and a bit of water...two basic requirements for a beach met. You do still have to pay to use the facilities on offer at the Sailing club, but at least it's affordable. Wish we'd discovered it earlier on. Would have been nice to spend some time there over the long, hot summer we've just been through. H absolutely loved it and kept singing all the nursery rhymes she could think of about the sea and boats. It was a bit windy and so she didn't get in the water - but she wasn't bothered - at least she had sand to play with (her favourite substance these days - I struggle each day to keep her out of the sandpit my neighbours have in their yard). It makes you realise that kids certainly aren't as critical as adults. I could see the satisfaction in H's eyes as soon as we entered the place. Her brain was doing a quick calculation: sand + water = fun. Aaaah being a kid again...the simplicity... it'd be nice to rewind and go back to that. I didn't take any photos on the day. I might see if my friend has any I can share in my next post. To get an idea of the beach, take a look at some of the pics at the link below (old link but it still looks about the same). Almost three years ago, I relocated to Bahrain from Melbourne, Australia with my family. I've found that living in the Gulf can be challenging at times and that A LOT can get lost in translation...but the people and the place have grown on me and I'm grateful that I have the opportunity to live abroad, experience something different and meet lots of lovely people in the process. I still miss home heaps!! My home-coming countdown begins, but in the meantime this blog will help me savor the expat experience and I look forward to sharing it with you!